University Writing Center (UWC) - What Makes a Good Resume? HOME> Students > Writing & Speaking Guides > Alphabetical List of Guides > Professional Writing > What Makes a Good Resume? Meghan: What are you looking for in the resumes that you are looking at today? John Ward: In the resumes we are looking at, just completeness of information. I need to know when you are going to graduate, what your degree is in, any area of specialty you are interested in, and also what life experiences you have that can benefit our company. Meghan: What are you looking for in a good resume today? Angelo Bianchini: Direction. Why do you want to work for us? Why did you come to our booth? What do you want to do with your degree? It’s not just a list of things it needs to be: why does what you have learned at A&M apply, and why should we look at you above and beyond everyone else. Dbrav Dunkley: So first of all a good resume is one that is well put together. It’s neat, concise, all the information that’s needed is right up front. You don’t have to go looking for it. It should never be more than a page. And you should put the critical information about what you are doing up front. Edrick Spence: A good resume will always have an education, your objectives, and it will always have your skill level. We’re looking at experience, things that have prepared you for the upcoming job. Can you relate to people? Can you work with people? Can you work under stress; sometimes there are stressful conditions. Jerry Hooper: Well a good resume obviously has to explain who the candidate is, what they’re about, what their background is, what they’re experiences are. That goes without saying to some degree. But what I would tell you is that on the resume be sure you explain who you are, what type of personality you have, what kind of characteristics you may or may not have. Jesse Saetz: We’re looking for a good GPA. We’re looking for job experience, like co-op positions or good interactions on their senior projects. Karen Pavlinski: Don’t put a lot of flowery stuff in it, and don’t try to explode a little background into a lot because it’s real evident to people who have been in the business for a long time. Meghan: What is one of the main things you consider? Would it be the GPA over anything else. Jesse Saetz: That would probably be the first thing that we’re looking for. We have a requirement. We would like to hire people with 3.0s or above. John Ward: GPA is very important. If someone doesn’t have experience, otherwise we don’t have a good way of gauging their abilities to succeed in our company other than academics. If they have more life experience, if they are a non-traditional student, sometimes we can give you a little bit of a break on your GPA, but obviously bigger is better. Edrick Spence: We place the most importance on that GPA. You know, are you taking power classes? What type of classes are you taking? And your GPA in those classes? Meghan How important is GPA when you are looking at a resume? 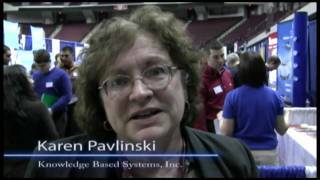 Karen Pavlinski: To me not; the proof is in the interview. Angelo Bianchini: I look at work experience because to me, when I went to college, I worked a lot, so I had a lot of experience, and I kind of look for similar things. Usually the GPA can be, it’s best not to hide your GPA because eventually it’s going to come out so you want to be upfront about it. If it’s low it’s low; try to explain it; don’t hide anything from us. And extracurricular activities, we like to see people who are active and outgoing especially in engineering. Most people consider engineers to be reclusive, so if you can show that you can really integrate into a new environment and you’re really people friendly, it’s good. Meghan: How important are extracurricular activities? Is that important at all to you? Jesse Saetz: Generally I don’t really look at the extracurricular activities. That’s more of an ice breaker or something like that, but I don’t typically need to talk about the extracurricular activities. Jerry Hooper: I’m looking for work experience. We’re looking for outside activity type experiences whether it be work, or non-profit, or volunteers. We’re looking for personal traits and characteristics, which are hard to draw out in a resume but are really important to a business. Dbrav Dunkley: Work experience will be relevant to what you are interviewing for, and the work experience is most important around specific skill sets that people are looking for. Home Students Writing & Speaking Guides Alphabetical List of Guides Professional Writing What Makes a Good Resume?